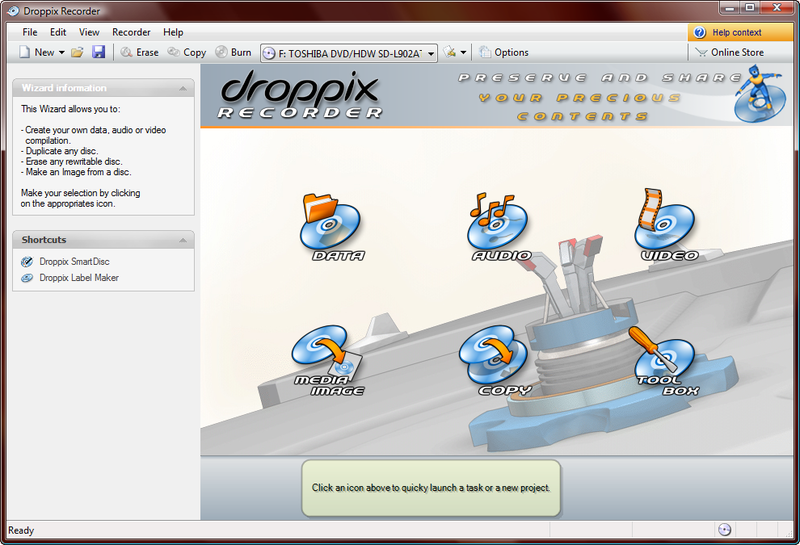 Droppix Recorder is the most complete and easiest to use solution for copying and burning all your files to CD and DVD. Whether you are creating your own music compilations, printing a Lightscribe disc label, burning your vacation memories, making a copy of your favorite CD, or simply backing up your important data files to CD or DVD... Droppix Recorder makes it simple! Droppix Recorder support for Blu-Ray discs (BD-ROM, BD-R and BD-RE). Droppix Recorder is ideal solution for all CD & DVD burning and printing needs. Copy and burn all your files to CD and DVD. Qweas is providing links to Droppix Recorder 2.6.0 as a courtesy, and makes no representations regarding Droppix Recorder or any other applications or any information related thereto. Any questions, complaints or claims regarding this application Droppix Recorder 2.6.0 must be directed to the appropriate software vendor. You may click the publisher link of Droppix Recorder on the top of this page to get more details about the vendor.